This recipe is sooooo tasty! It has a nice crust made of walnuts instead of breadcrumbs, and the spice rub is delicious (Although, if you’re not digging one of the spices or you just don’t have it on hand, omit it and just add a little more of each of the other spices, or substitute it for something else). 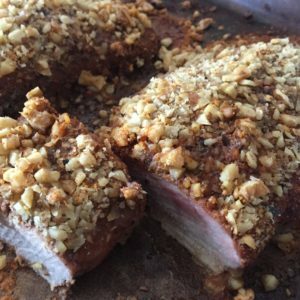 This Walnut Crusted Pork Tenderloin goes well with so many side dishes. You can slice it and put it on a salad or bed of greens. Or you can eat it along with the Lemon and Garlic Broccoli with Bacon. Or you can put it with a nicely baked sweet potato. Maybe you’d like it as a side for your eggs in the morning? The possibilities are endless! Remove pork at least 30 minutes before cooking so that the meat has a chance to get to room temperature. If necessary, trim the pork, and pat the tenderloin dry with a paper towel. Mix the mustard powder, paprika, onion powder, garlic powder, salt, and black pepper in a bowl. Rub the tenderloin evenly with the spice mixture. In a food processor (or by hand), pulse (or chop) the walnuts until finely chopped. Coat the pork evenly with three quarters of the chopped walnuts. Place the tenderloin in a baking pan and roast for 25-30 minutes, until the pork reaches 145 degrees F. Let the pork rest for ten minutes.